progress updated as of now. I am still on page 1 and 2 out of 20 pages. 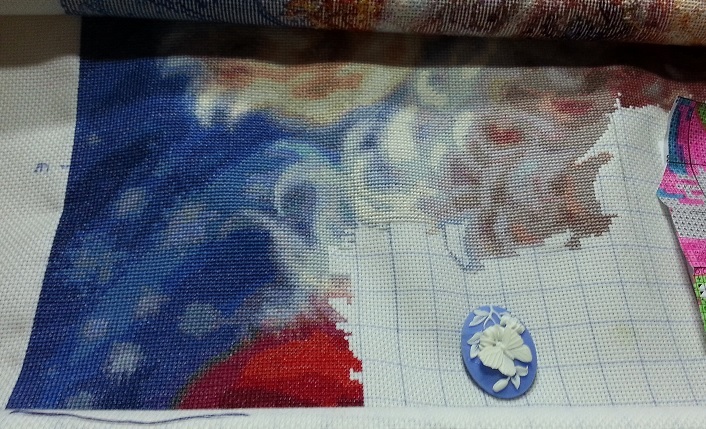 It will be about 36 inches wide so I decided to stitch it on 18 ct aida, two over one. 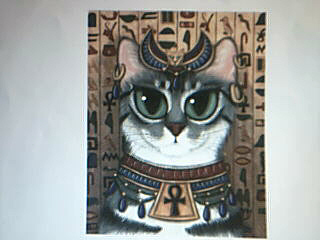 This is called "Bast Cat" designed by Michele Sayetta. I have two other HAEDs in my rotation. "Dance of the Kokopelli" on 25ct and "Humble Adobe" on 28ct. Hello, my name is Florence, I'm sorry but wanted to change my article I deleted it! So I do it again in simpler. I was talking about my 3 HAED finishes. There's "snow princess" - "Face of faery 90" and "Ballerina sisters"
Now I embroider on Aida 7 points unbleached one wire, except for the "snow princess" or I embroidered cheesecloth linen 12 son in one thread on one wire. I also started three models, namely "water dragon" - "little friends" and "QS Porthole of Fantasy Chart No: 14 HAEJBGQS"
Hello, Here is my new update on "Little Friends". 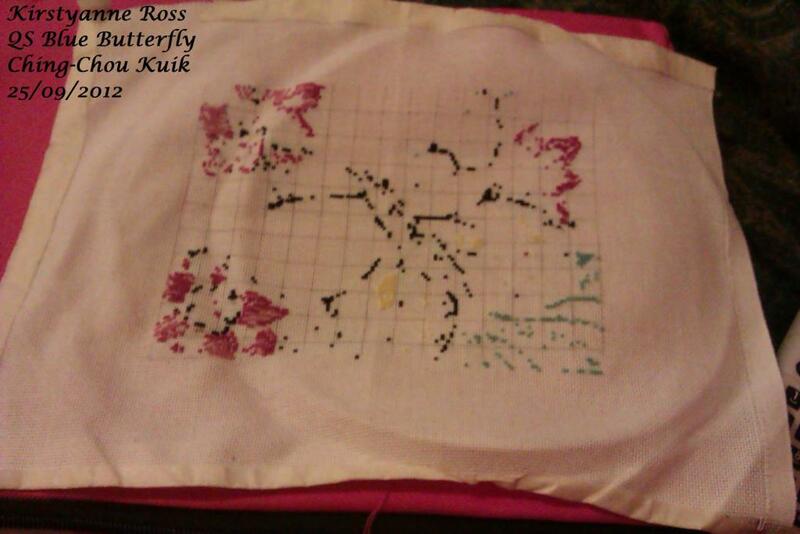 This is the fifth page of embroidered 24.
probably be a while till I have another page finish. 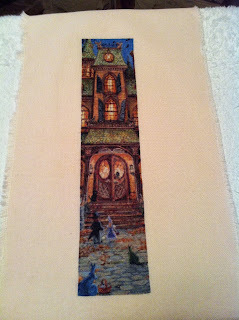 So here is the tail finished and the second page finish. 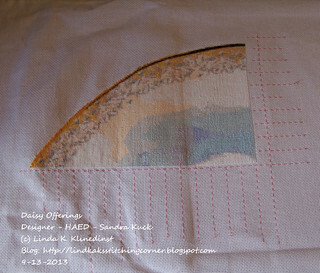 Daisy Offerings - HAED - Sandra Kuck....Stitching this on 18 Count White Aida 2 x 1 Full Cross Stitch. I have finished another Column and I have started another Column. I am still on Page 3 out of 36 Pages. A Fathers Touch A Mothers Kiss - HAED - Schim Schimmel. Stitching this on 25 Count White Lugana 1 x 1 Full Cross Stitch. I am almost done with a Column. I am on Page 1. I thought I would wait a while to post an update on my Giraffe Silhouette by Kai, but I love it and wanted to share it. I don't know why I didn't think there would be a lot of confetti, but there is. Fortunately also some small blocks of color which are a bit of a respite. 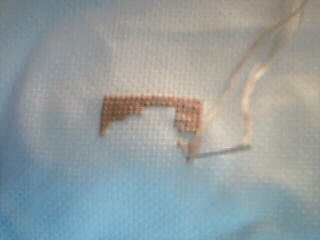 This is really a lot of fun to stitch. This is page 1 and 2 as the first giraffe silhoutte goes down the middle of both pages so I have two pages going at the same time. I often go over the middle if it is only a few stitches on the next page, but this was pretty constant. I'm not sure if it will stay where it is in my rotation or show up a bit earlier. Depends on how loud a giraffe can holler I guess. 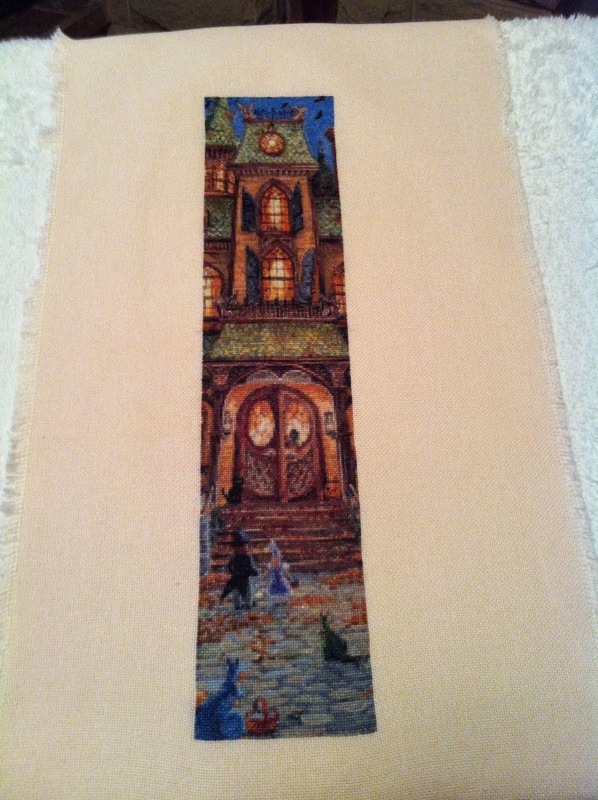 This is the piece I am currently working on: Dancing with the Cat by Sandra Kuck . 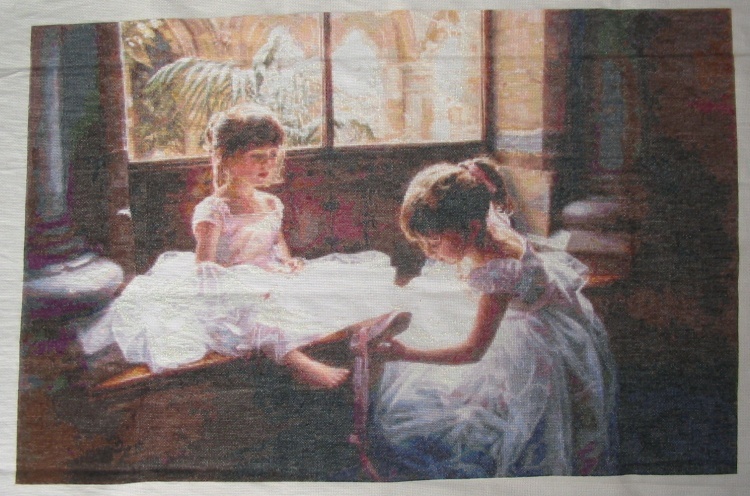 It will eventually be a gift for my niece, who is now 23 but danced ballet from the age of 3 through high school and has two cats that she adores. Couldn't imagine a better gift. It is stitched 1 over 1 full crosses on 25 ct lugana or jobelan. (I can't ever remember which is which). Two pages finished and now working on page 3. I think that everytime I post an update I will also post the current WIP so that I can introduce you to the variety of HAEDs I'm doing. 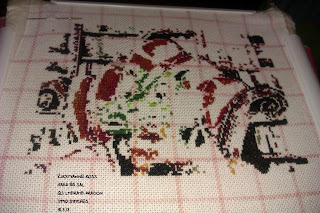 I just finished my first page of Punch of colors 3 it's a partial page the top right hand edge of the pattern I am amazed at how it's coming along at the moment the stitching has used only 18 colours. The confetti has been a bit of a pain I am missing colour a little at the moment I am going to try and keep on going and at least try to finish her tail. I have an update on The King. 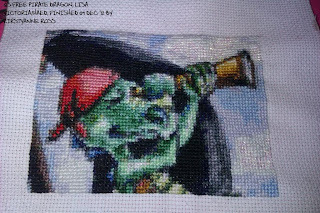 I started in the middle, thinking about not stitching all of the background, maybe just the darker oval directly behind him. I'm figuring it out as I go along. This is the detail from pages 1, 2 & 5. Thanks for looking! I decided to start on "Bast Cat" by Michele Sayetta. I have two more other HAEDs and will post photos of them when I find the charts and materials in my UFOs bin. Here is where I am at. 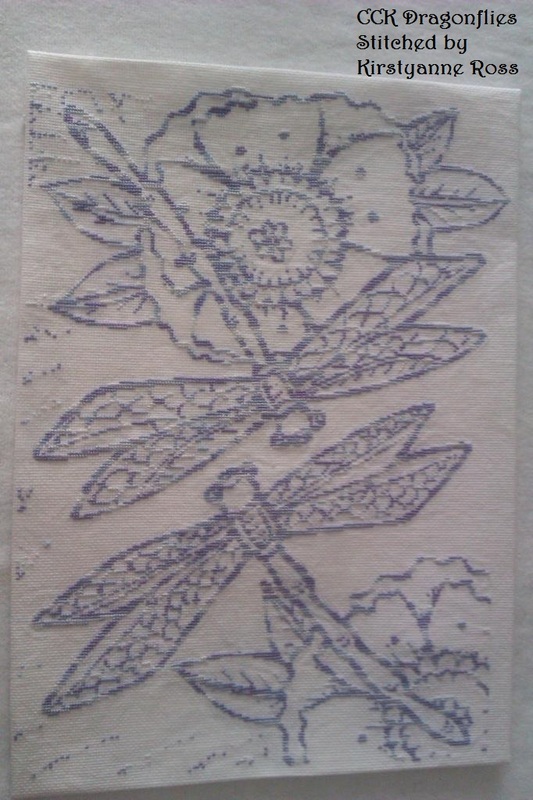 This is stitch on 18ct aida with 2 over one. I am using DMC threads. I have 20 pages to go. Oh Dear I have not posted on here for so long I don't even really feel like I deserve to, as I have been so slack adding updates.... So what have I been up to I see to travel from project to project doing about a page and then moving on, please tell me I'm not the only person who does this lol. I have started about 6 different things that I am not going to go into to much due to the embrassment facter hopefully I will pick some of them up again in the future. Daisy Offerings - HAED - Sandra Kuck. 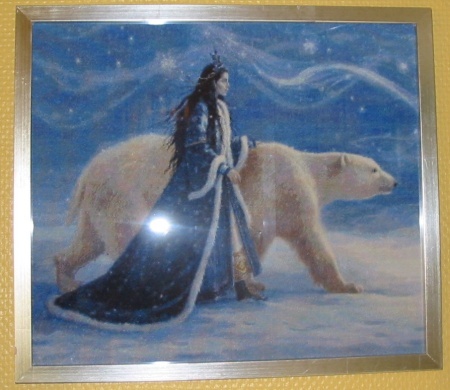 I am stitching this on 18 Count White Aida 2 over 1 Full Cross Stitch. I am on Page 3 out of 36 Pages. I have finished another Column. This is my first HAED Project. 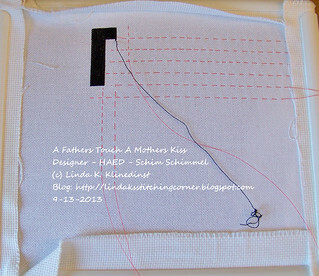 A Fathers Touch A Mothers Kiss - HAED - Schim Schimmel. 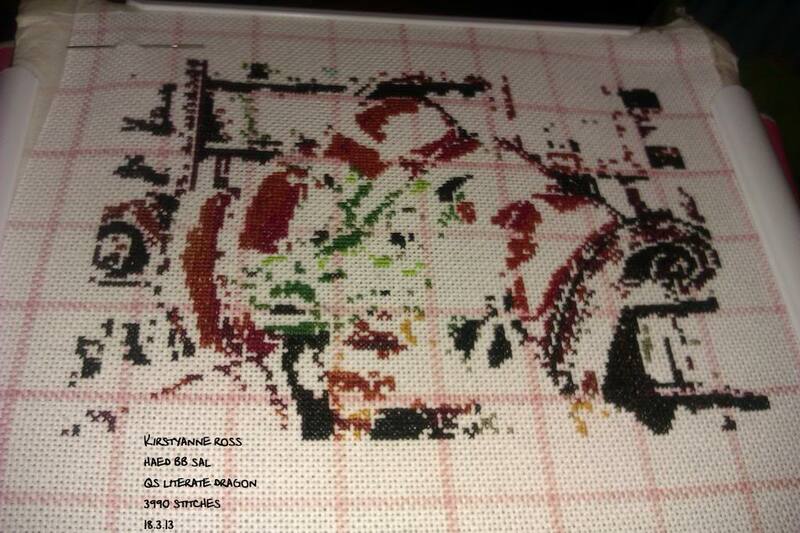 I am stitching this on 25 Count White Lugana 1 x 1 Full Cross Stitch. I am on Page One. 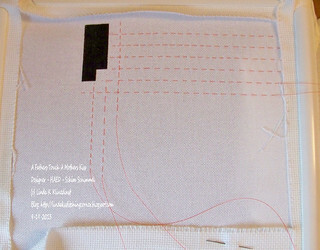 I am stitching the background which is all black. I am using DMC #310 for my Black. This is my second HAED Project. As soon as I get the material and all of that I am going to start my 3rd HAED Project called Pansy. I can't remember who the Designer is at this time and right now I'm not sure where my Pattern is at. I love HAED Patterns. I have several on my Wish List through the HAED Website. 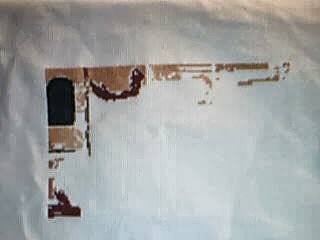 Here is my HAED project! Is almost done..
And a small update. As you know I did a big cleanup of membership. As a result, I've been able to invite new, full posting rights members. So far I've sent out 52 emails asking if buddies are still interested in full membership. I've made it through requests dated from December 17, 2010 to December 30, 2011. I've given each person a week to reply, yes or no. So far I've received 17 positive responses. Note to the new members. 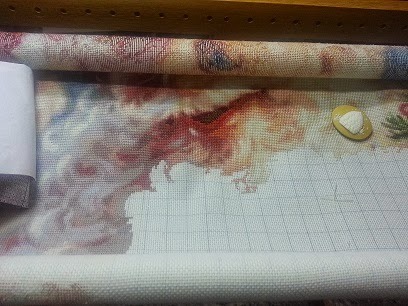 Please remember to include stats on your pieces (chart name, artist, fabric count/color, full cross or tent etc., number of threads used (1 X 1, 2 X 1, etc. ), specialty fibbers used? ). Also please always sign your posts with your name. I hope you enjoy your time here! And as always Happy Stitching! Hi. I'm Carole and am excited to be here. This is not just my first post on this blog but my first post ever in a blog. 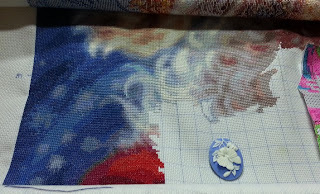 I've been stitching for a long time, but discovered HAED just a little over 2 years ago through another forum and became addicted in nanoseconds. I was a one piece at a time stitcher then. 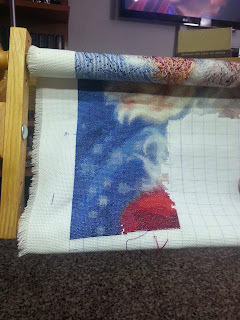 Now I have 8 HAED WIPs (and a few non HAEDs) going and have never loved stitching more. Thought I would start by showing my 2 finishes. I did this one last year for my sister's birthday. 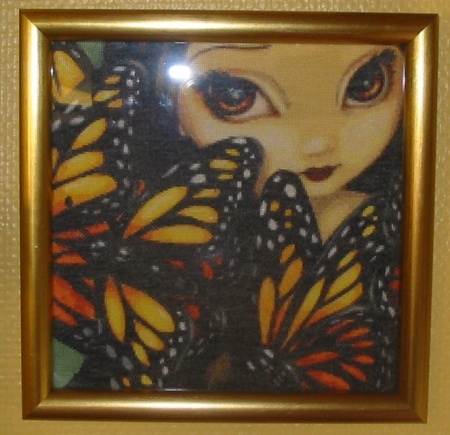 This is mini Amethyst by Rachel Anderson. 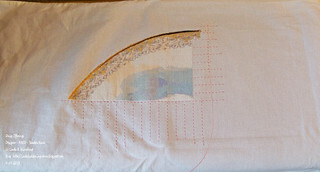 Tent stitched on 25 ct lugana or jobelan. It's her birthstone and I loved stitching it. It wasn't my first HAED, but my first finish. I discovered with this one that I love mini's and have several going on now. 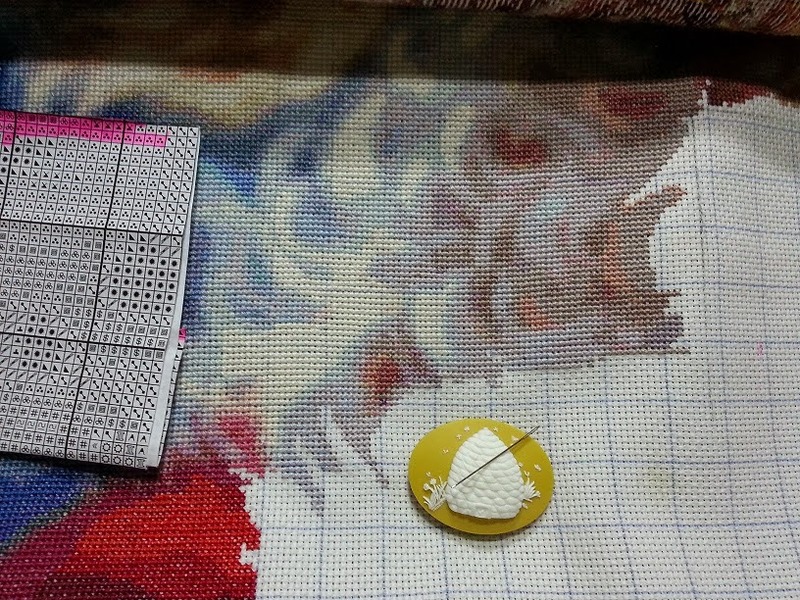 Generally if I am stitching a piece meant to be a gift, if its a mini there is a chance I might finish it in this lifetime. My first HAED was Burden by Krystal Camprubi. 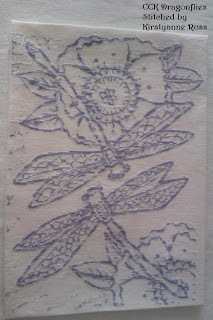 Stitched initially on 25 ct evenweave 2 over 1. I learned soooooo much from this one. 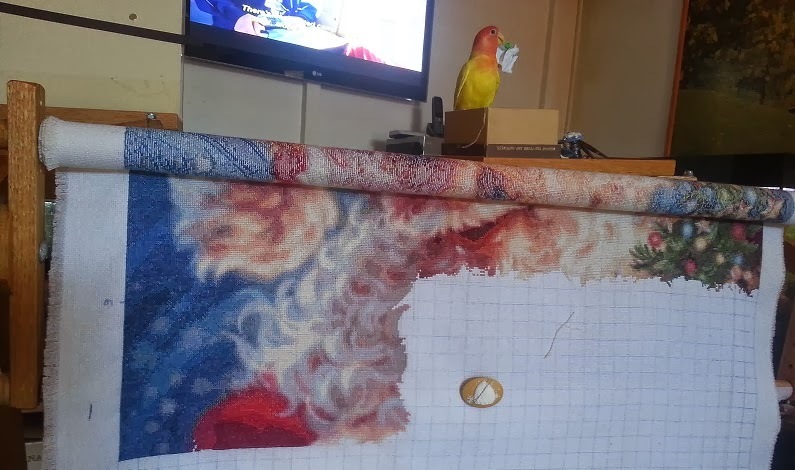 After spending a year stitching 6 1/2 pages of almost completely black background I found that when I got to the confetti heavy gold chain in the chart I could not get the needle through the fabric. Two strands was clearly 1 strand to many for the way I stitched. I had only tested it with the DMC black and didn't check what confetti would mean for me. Rather than just put it in the back of a drawer. I decided to start over. I had been doing several others at 1 over 1 on 25 ct by now I had invested in a magnilight and opted for 28 ct lugana 2 over 1 tent stitch. Perfect for me. I am now up to pages 4 and 5 (both are almost all black). The pic is through page 3. My newest start is Annya Kai's Giraffe Silhouette started on 8/30/13 in the new Starts SAL. Not much to see as I didn't get to stitch as much as I wanted last week, but am still working on it and should have more to show in my next post. As I work on my rotation, I will post those pictures then. Thank you all for letting me share my work with you all. Now if I can figure out how to end with my signature, I will post this one. If not signature shows up, I'll be sending Louanne an email. Thank you for letting me join and inflict my updates upon you all! Kirsten Mills - SK Fragile stitched one over one on 25 count magic guide. I've gone through and deleted all members that have not posted in the last 6 months. I should let you know that the way blogger handles the Authors is screwy, not in any order, so I may have removed someone that shouldn't have been removed. If you think I made an error just email me to be reinstated. The next part of this process is to go through all the buddies (in order) and make them full posting members. I will be doing that over the next month or so. If you've requested membership/buddy rights expect to get an email from me (if your name comes up before I run out of slots) informing you that you will be made a posting member and asking what name you would like to use when posting. 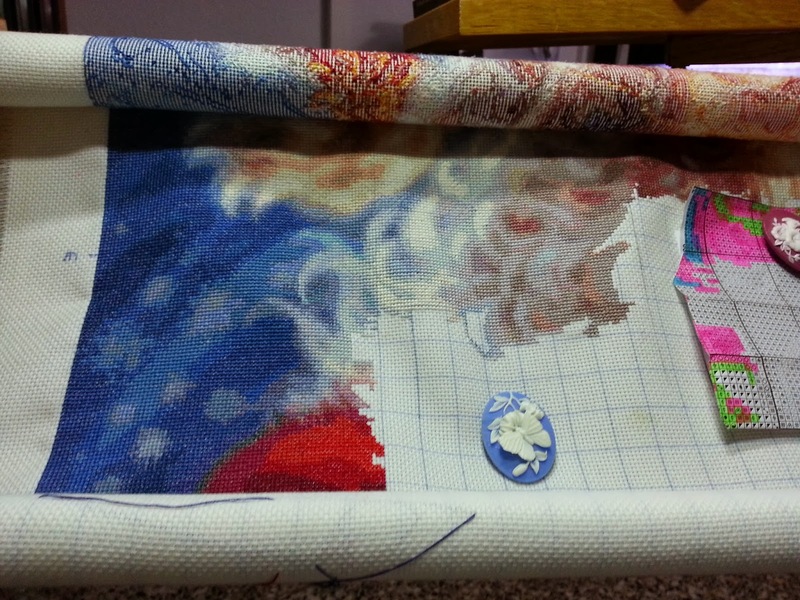 You will notice I've emptied out the Stitchers/Buddies lists on the right. I will put it all back as soon as I have the membership completed. Thanks for your patience, I know this has been a long time in coming. Heres my latest update on Hannah Lynn's Princess Izzy now I have completed pages 13 and 14, still a very, very long way to go! 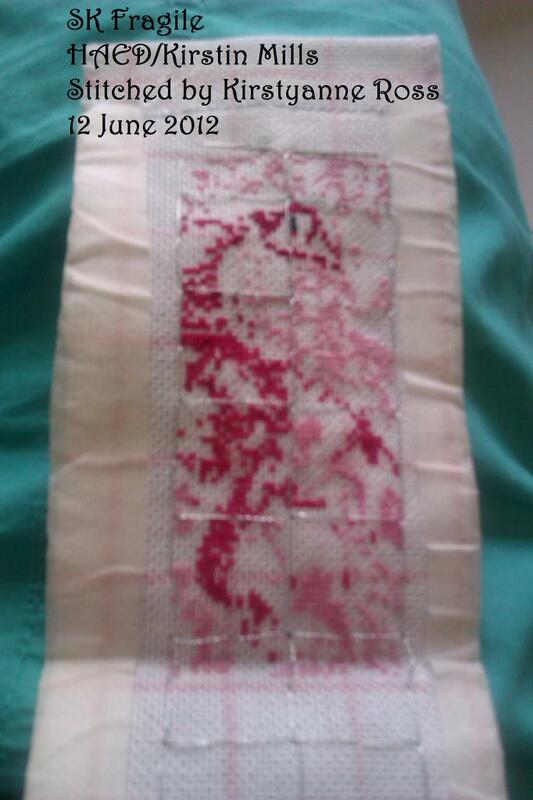 Stitched on 25 count evenweave, 1 over 1, full crosses. SK Trick or Treat. Stitched 1x1 full cross on peach 28ct evenweave.